Today I’ll describe a little secret – a stealthy autostart key that is not very well-known and is very reliable since it is used by… well… the Windows Update. Note that you can also simply ignore the copying and drop the file anywhere, and just point ‘CacheFile’ and ‘TargetFile’ to it. If you look at the first screenshot you will notice the Procmon logs show a reference to the ’20MUIFixUp’ entry. will create ‘C:\WINDOWS\system32\malware.dll’ anytime you boot the system (but the file won’t be loaded/executed). The’ 20MUIFixUp’ entry in the Registry will be deleted afterwards (so it needs to be re-created). 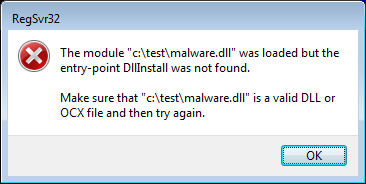 Misc    Registering binary: C:\WINDOWS\system32\regsvr32.exe  /s "C:\WINDOWS\system32\malware.dll"
My test DLL was not prepared correctly (missing exported ‘DllInstall’ – see below), but the DLL still loads. At least on Windows XP. Okay, what about newer versions of Windows? First, let’s fix my DLL. Because the ‘RegistrationFlags’ parameter can be equal either to ‘1’ or ‘2’. If it is 1, the ‘DllInstall’ API will be called. Otherwise, it will be the ‘DllRegisterServer’ API. 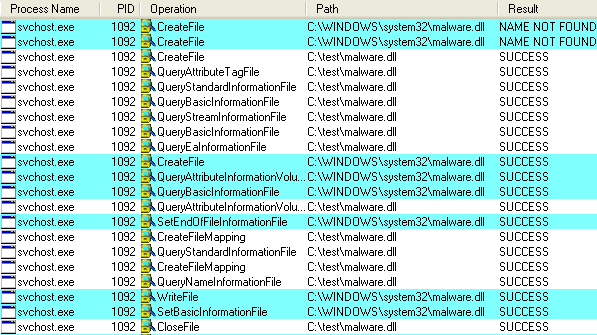 Misc    Registering binary: C:\Windows\system32\regsvr32.exe  /s "C:\test\malware.dll"
Misc    Registering binary: C:\Windows\system32\regsvr32.exe  /s /n /i "c:\test\malware.dll"
The trick works like a charm for Windows 7. I don’t see it working on Windows 10 though, but perhaps it has to be triggered some other way.